Sharp Tree Service offers professional landscape irrigation services! With the intense thunderstorms that covered North Georgia this week, we at Sharp Tree Service figured we would let you know about our landscape irrigation services. The downpour gave area homeowners plenty of rain for their lawns; however, we are quickly approaching the summer which is usually a dry time for metro Atlanta homeowners. Every summer you hear continuous complaints of the Georgia drought, plus some areas are under water conservation restrictions. That doesn’t help a thirsty lawn survive. Sharp Tree Service can improve the health and annual maintenance of your grounds through landscape irrigation services. Let’s take a closer look. Landscape irrigation services involve a little creativity. If you don’t have a creative bone in your body, don’t panic. We got you covered. In fact that’s where we come into play. Sharp Tree Service offers complete landscape irrigation services including the design, installation and maintenance of your irrigation system. Some of you lovely southerners probably remember Papa’s landscape irrigation system from back in the day. It was called a water hose. The days of standing in the middle of front yard in flip flops are over. Sharp Tree Service provides landscape irrigation services with a twist of modern technology. 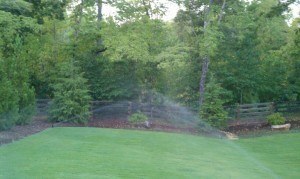 We can design an irrigation system that compliments the layout of your land. If you want a programmable irrigation system, we can oblige you. In this age of convenience, why can’t you have a sprinkler system set to a timer? You can set your timer to water your lawn at a certain time of day to conserve on energy and water. Different types of irrigation systems include drip, mobile, overhead and underground systems. A drip system offers minimal water loss from evaporation while an underground system easily works with your yard patterns. Sharp Tree Service can install them all. Your yard should be a calling card for your home. It’s the first thing people see when they approach your residence. If your yard looks dry all the time you most likely have plants that require a ton of water to look vibrant and healthy; however, there are plenty of plants that can thrive in the Georgia heat with low water intake. Sharp Tree Service can install plants and trees that require little water for annual survival. This will help take away the look of starvation from your current plants. This can also save you money as you will not have to run up your water bill to maintain them. We will map out your landscaping to determine what kind of plant life you have and what kind of plant life your grounds can support in this area of climate. Our complete landscape irrigation services will keep your lawn healthy throughout the year and the envy of your neighborhood. Call Sharp Tree Service for a FREE estimate on landscape irrigation services today!